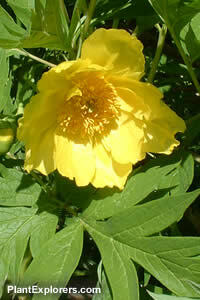 Upright, sparsely-branched deciduous tree peony with dark green leaves that are deeply cut into pointed lobes. Bears nodding, single cup-shaped yellow flowers. Height and spread is 5 feet. Paeonia seed can develop a deep dormancy if allowed to dry. The Seed Collectors have kept their Paeonia seeds in cold moist storage to reduce the occurrence of deep dormancy. For maximum freshness, please keep seed refrigerated in its original packaging until it is time to plant. Sow fresh seed in autumn in containers in a shaded cold frame. Within six weeks a root should develop, to be followed by a leafy shoot in spring. Grow on in well-drained fertile soil in a location sheltered from wind in full sun or part shade. Spring sowings may be made in containers and stored in the refrigerator for two months, then moved to a sheltered position to develop the leafy shoot. Protect from heavy frost the first winter, but avoid wrapping the plant as this can promote mold.